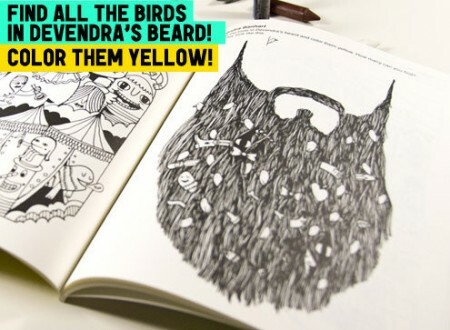 Win a Yellow Bird Project indie rock coloring book! If you haven’t spent any time around little people lately (kids, not midgets) perhaps you’ve forgotten how deeply calming it is to pick up a marker or a crayon and just spend some time coloring. Your friends at the most excellent Yellow Bird Project have not forgotten this truth, and in the spirit of creating more awesomeness in this world, they’ve put together an Indie Rock Coloring Book that is suitable for kiddos or creative grown-ups. Color in the whimsy of Andrew Bird’s whistling, or shade in Clap Your Hands Say Yeah’s crazy carnival — we’ve got a couple to give away. The YBP are the folks that have all our favorite musicans design original artwork for t-shirts (I have and love The National shirt — and you should check out the new Ra Ra Riot one!) with all the funds going to charity. This new coloring book is no different, with all the proceeds going to good causes. I met these fellas at Outside Lands in SF this year, and they are making some positive change in the world despite being younguns. Idealism works sometimes. 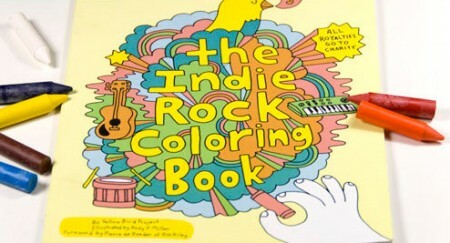 ENTER TO WIN THE INDIE ROCK COLORING BOOK! And oh, yeah. They have a theme song written by Swedish folk-wunderkind Tallest Man On Earth (!!). I *so* want a theme song. Tagged with contests, the tallest man on earth, yellow bird project.